This was the WOD that Greg Amundson completed with members of the Royal Norwegian Force Protection Unit on June 26, 2012, just outside Olso, Norway. The WOD was done in both individual competition and teams of two. If done as a team, divide the work as deemed necessary. Each Athlete must complete at least 10 repetitions at each station and may pass the ball back and forth during the run. The fastest RX’d time for team competition from the Royal Force Protection Unit was 7:14. Greg Amundson had the fastest individual RX’d time time of 7:30. Greg Amundson with the Royal Norwegian Force Protection Unit in Olso, Norway. 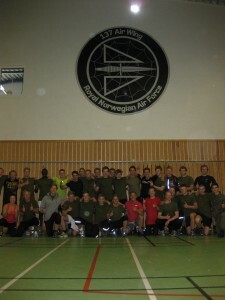 CrossFit and the Military: The Norwegian Royal Force Protection Unit is an official CrossFit Military Affiliate. CrossFit has made major contributions to both the United States Military and our Allied Military forces in physical fitness. Following the implementation of a CrossFit program by Greg Amundson at the California Army National Guard Officer Candidate School, Class 2011 Candidates improved their Army Physical Fitness Test (APFT) score from an average of 192 to 248 within a six month timeframe and graduated the most physically fit class in the nearly forty year history of the school. The program implemented at the OCS school is available for use at any Military schoolhouse. Contact Info@CrossFitAmundson for a copy of the operational plan. If you are a member of the US Military or allied foreign counterpart and are interested in CrossFit Affiliation, send an e-mail to: AffiliateSupport@CrossFit.com. Reflect on the quote from Malcomb Forbes above. Are you doing what you love and loving what you do? If not, what’s preventing you from making a major life change, and following your heart? Post thoughts to comments.